The vast majority of technical products must ship with technical documentation including text, graphics and illustrations. In addition, many products must supply CAD data for spare part solutions. More conveniently complete these processes with newly added functionalities in the 3DViewStation software portfolio with its ultra user-friendly interface. “To uniquely identify components when ordering spare parts, companies need the ability to add callouts and callout lines with IDs. 3DViewStation accommodates the callout process in both an automated and interactive way," commented Kelly Baumann, KISTERS North America Business Development Manager. The interactive option utilizes the bill of materials -- using names, generated IDs, and even attributes. Callouts can be positioned one by one manually or automatically arranged into a multitude of preset options with a single click. Additional settings define the shape of the callout, text color, font and size of the callout line. During rotation of the geometry, you may also tweak the position of the callout to your liking. The result can be shaded in a typical 3D colored style or in a classic black and white technical illustration line art. 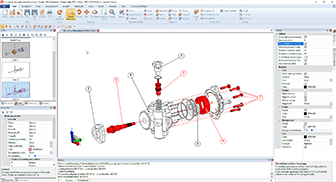 Reuse these assets for the final technical manual or spare part application by saving them as a 2D image, 2D vector drawing or 3D model, a time-saving feature consistent with 3DViewStation, its high performance viewing, advanced analytical tools and flexible integration with leading CAD systems.